I was born January 3, 1968 at Oakland Hospital, and grew up in a loving home. I was 10 years old when my dad told me I was adopted and my biological mother was dead. It was shortly after November 18, 1978, even as the news was still reporting on the tragedy in Jonestown. 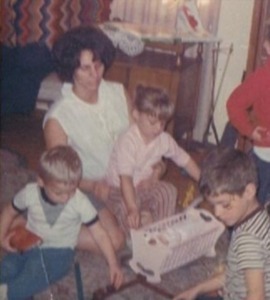 My dad pulled out a picture of Agnes Bishop and her children, a photo taken in December of 1967, just before my birth. Agnes and her children are visiting my parents at Christmas. You can see the decorations and Christmas tree in the picture. I am there in utero, only days away from birth. In the years since my father’s revelation, I had wondered about the children in the picture, but never followed up. Then as a father myself about five years ago, I started researching. All I could say up to that point was that I’m American, born and raised in California. I figured I should look into my past, if for no other reason than to answer my children’s questions about my heritage. The identity of my biological father was a mystery, but I did have a start: My mother’s name was Agnes Bishop. Before she married, she was Agnes Jones, the daughter of Jim and Marceline Jones. Like me, she had been adopted. This past year has been productive regarding my search for information about her. I’ve been lucky to meet people who knew her and my siblings. 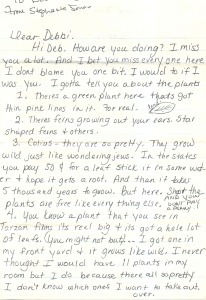 I even received original letters my older biological sister Stephanie Lynn Jones had written to her friends. I am lucky that she liked to write. 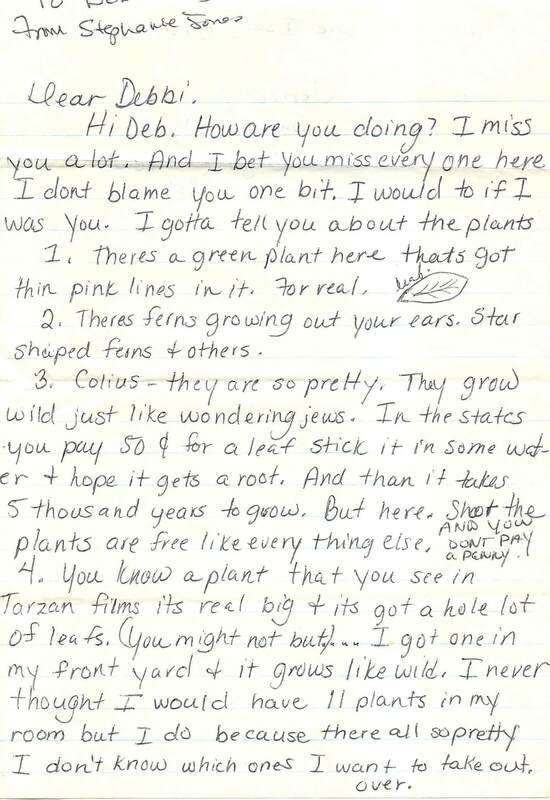 The letters give me something tangible of her life, bit and pieces I hadn’t known before. I’ve learned, for example, that she seemed to enjoy nature, and her description of six plants native to Guyana which she had growing in her room revealed her excitement. I’ve heard other stories as well about my biological family from the community they were a part of. My search in the past was difficult. It was like going to the library and not finding the book you are looking for, because even though you’re surrounded by books and you know the information you’re after is somewhere in them, you don’t have a catalog or a guide on how to find anything. I have looked into the FBI files released under the Freedom of Information Act, and I’ve gone to the California Historic Society in San Francisco to look at Temple records. A number of books have been written about the Temple and Jonestown – and I’ve looked at most of them – but they say very little about Agnes. At the beginning of September my wife and I went down to San Diego for a gathering of Temple survivors – another metaphorical trip to the library – and while I had high hopes, I also had low expectations. I figured, if I met people in person, just maybe they would believe my story, maybe the personal contacts would validate me. I look back at that week as a wonderful vacation during which I met incredible people. I had to change the way I was looking for information as well. I was no longer at a library, the wealth of information I was gaining had faces and names. I was welcomed by everyone, and felt genuine love. I like people who are willing to trust. I tried to thank everyone who welcomed my wife and me into the Temple family, and to those I might have missed, I thank you now. My search continues. I would welcome any information. Any news is good news. Please contact me with any information about Agnes, my siblings, and her various friends and family she may have had. 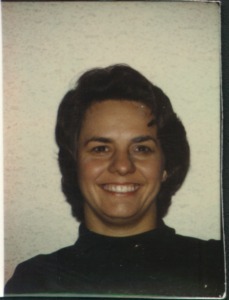 Even though Agnes died in Jonestown, it is my hope to reach back to her past and to her life outside of Peoples Temple. Everyone else knows that Agnes Jones was the first adopted child of Marceline and Jim Jones when she was 10 or 11 years old. The adoption took place in Indiana. Some say she was Native American and/or the daughter of a prostitute. There are some recollections that Agnes might have had some issues with her intellect. Whatever the truth is I do not know. The Jones rainbow family and miracles of healing may have driven these rumored backgrounds. Agnes worked as a nurse and convalescent home administrator. She had four other children besides me, three born before my birth and one born afterwards. The general consensus about my mother from the people who knew her was that she was usually happy and considerate, and had a free spirit. Her children also defined her, and seem to be a part of many people’s memories I’ve heard. Another observation was that there was drama when she showed up and drama after she left. It seems she came and went from Peoples Temple as well. Adoptions are a joyous occasion for the new parents, but the other side of adoption is the tragedy of giving up a child. Adopted herself at age ten, Agnes had to have remembered the heartache she and her parents felt. To choose to give me up for adoption had to be heart-wrenching as well. I wrote the words below as I wrestled with my adoption and with Agnes’ adoption. Her blood may flow through me, but that is not simply enough. It’s hard to find anything out about her and the first ten years of life. What’s right, and what rights I have are two different things. Adoption opens doors and shuts them. Blood and laws breaks and binds the family ties. A family full of love adopted me. Before I was born they cared and named me. Raised and gave all they could to me. Originally posted on October 10th, 2014.